Episodes 100: The Hundredth Episode Spectacular! There’s lots more to come! Two years six months after launch, I bring you the hundredth episode of the Exposing PseudoAstronomy podcast. There are two “hours” to this episode, two separate files. Because I use so many clips from various paranormal broadcasts, this entire 100th episode(s) is an homage to those paranormal shows. I play the credulous host, have guests on, and some “open line” callers. I also included bumper music and commercials. I hope that it turned out well — it’s one of those ideas that looks and sounds great in your head, but you’re not sure how well it turned out or if other people will like it. This episode couldn’t have happened without all the people who contributed their time and voices, so I want to thank: Karl, Mike, Expat, Parrot, Dave, Warwick, Tim, and Justin. Also a very big “Thank You” to the folks at The Reality Check – Adam, Elan, Darren, and Pat – for sending me a promo to use, Sharron Hill of Doubtful News and Tim Farley of The Virtual Skeptics for their last-minute scrambling to also send me promos. And to Pamela Gay for sending me a promo literally just after I finished editing everything, but hadn’t done a final listen-through so could still fit it in. I will note that I did contact several other skeptical groups and outlets for promos, but for various reasons they were not able to get me an audio file to use in time. So … with all that said, sit back, relax, and hopefully you enjoy the episodes that is and are, Episode 100. Feedback, as always, is appreciated (constructive feedback). My blog is getting a lot of hits! Yay! Steadily increasing over the last 12 hours, now over 3x the traffic as usual. I’ll do another one Saturday and see what that one looks like. 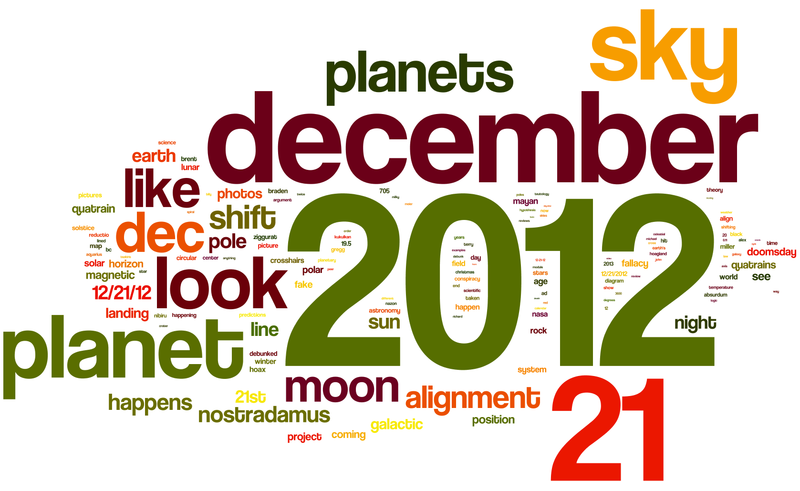 May be interesting to do word clouds for the 19th, 20th, 21st, 22nd, and 23rd, and see how they change. Oh, P.S. … I forgot to scale the most common terms by the actual number of times they were searched. The word cloud above was created by taking the unique search terms and putting them into the cloud maker. As in, if 20 people put in “nostradamus quatrain 2012” and 5 people put in “sky december 21” and 3 people put in “nostradamus quatrains 2012” then the cloud would have nostradamus 2x, 2012 2x, and the rest 1x. When I make a new cloud, should I take the repetition into account? For those who don’t know ’cause they were living inside the spaceship that is Phobos, Venus transited across the face of the sun last week on June 5 or 6, depending on which time zone you’re in. A prediction of my Transdimensional HyperPhysics theory – which is based on Soviet-era research in the USSR that Western so-called “scientists” refuse to talk about – is that something wonderful would happen during this event. To be more explicit, I have a pendulum. Pendulums should swing at a steady rate that is only based on the length of the pendulum and the gravity field its in. A Foucault Pendulum is a special kind of pendulum that proves Earth rotates, and again, the period is only dependent on the length and local gravity. Except in my Transdimensional HyperPhysics model. My theory, again, based on REAL research carried out in Soviet labs, predicts that pendulums will be have weirdly during transits like this. Ancient civilizations were much more intelligent than us, and they knew of this physics and built their sacred spots in places where this physics manifests on Earth. The Four Corners area of the US southwest (named because it’s where Colorado, New Mexico, Arizona, and Utah all meet at one corner) is one of these special places on Earth where this Transdimensional HyperPhysics energy manifests extra-strong. So I went there with my “its complicated” person in the Exposing PseudoAstronomy-mobile. And I took along my trusty pendulum that has been thoroughly tested by top scientists to be accurate to the microsecond in its period and the size of its swing. I had this hooked up to an angle sensor that fed data into my laptop computer so that I could measure exactly the size of the swing and exactly how long it took. I started measuring 15 minutes before the transit and continued for another two hours. As you can see, as soon as the transit starts, something wonderful happened to the pendulum where both the period and the amplitude changed!!! And during the transit, with roughly the time it took Venus to move its diameter across the sun, there was a weird amplitude shift and the period was still faster!! Since the length of my pendulum didn’t change, that means that the gravity field did and/or the basic laws of physics that Western establishment “scientists” think are right are WRONG!! Whereas, all predictions made by my Transdimensional HyperPhysics that says that extra dimensional energy gets pumped into things like pendulums during stuff like this! Hello all. I know I haven’t posted in awhile – I think twice in the last five months or so. As stated back in January, I was working on graduating. As the title for this very short post suggests, I did. I’m now in that ~5% of people in the world that has a Ph.D. Actually, a B.S., M.S., and Ph.D. And we all know what those stand for (since this is a PG-rated blog, I won’t go into that, but you can look it up). And so, I am now able to use the argument from authority, “I have a Ph.D. I’m right, you’re wrong.” And I can be content living in my Ivory Tower of academia, isolated in my own field without any consideration for others, thinking deep thoughts and adding to the elitist knowledge that the Illuminati and Bilderberg Group use to run the world behind the scenes. Or — wait. Maybe not. I have two half-time postdocs, one continuing my previous work, one being project and science lead of the citizen science project Moon Zoo, and yet other than a small salary increase, nothing has changed. I still work most of the time from my apartment and I still drive the same budget car. I’m still studying craters, though I’ve expanded from Mars and am obviously also now looking at the Moon. I still have to tie my findings into the bigger picture since nothing in science exists in isolation, and I’m still just as fallible as I was before. Or maybe that’s just what I want you to think. Anyway, now that I’m done with my degree and starting to figure out how to get my motivation back in gear, you can start to expect more regular blog posts. I’m still working on my 2012 Astronomy eBook/PDF doc, and — shhh! don’t tell anyone! — I’m tossing around the idea of a podcast based upon this blog (if the Dumbass can do it, so can I). As far as I can tell, other than Phil Plait’s defunct but still-available-on-iTunes podcast, no one actually has a “bad astronomy” podcast out there (if I’m wrong – which I can’t be because I have a Ph.D. now – please post a link to it in the comments). The format would be short and sweet, I’m thinking of bi-monthly and a 15-20 minute format. In the past, I’ve had a bit of obvious fun on April 1 with my posts, such as last year’s where I explained how I had seen the light and was giving up science. And apparently it wasn’t too obvious to all that I was joking, as Michael Horn apparently thought I was serious. Any and all of these things, if real (and by “real” for NDEs I mean they actually cannot be explained by biology), would mean that there is some form of existence after we die in this one. Seriously, I would be delighted if this were true. I don’t care what people say about how I can’t have this be true because it would mean there’s accountability, or that I can’t just do anything in this life ’cause I’d be reincarnated as a cockroach, or whatever. Living for maybe 75 years and then ceasing to exist is a scary thought. Occasionally late at night, it crops up in my mind and I get freaked out. But that doesn’t mean that I believe that there is a form of existence after this one. I see no hard, reproducible evidence for it, and all the purported evidence that people have put forth is generally easily refuted (especially when we’re talking about ghosts and mediums). I agree: If I have a vote in the matter of whether there will be a life after this one, I would vote “yes, I want there to be one.” But do I actually believe there is one? No. In what you’ll quickly discover is a theme with this post, I think this would be cool, assuming of course some sort of benevolence as opposed to an Independence Day style of alien invasion. More Vulcans, less Borg. But do I think that tiny light in the sky that I happen to not be able to explain at the moment is an alien craft? No. Do I “believe” the Betty & Barney Hill story? No. Do I think Billy Meier’s laughable evidence is proof of visitation? No. Following from the last section, this would again be pretty cool. Though I find it odd some people think Earth was the brothel of the galaxy eons ago and the idea that deviant aliens came here to make sweet sweet monkey love is wacked out. Again, actual real evidence of alien visitation in the past would be very neat. Evidence of an alien civilization on Mars or some other body in the solar system would likewise, I think, be cause of great interest and people would flock to it. Does that mean I think the Nazca Lines are ancient alien landing strips? No. Or that aliens built the pyramids? No. Just because we may not have a mundane explanation for something now does not mean that “aliens did it.” Or, following perhaps a frequent refrain of creationists, it does not mean that “aliensdidit” (a la “goddidit”). Similarly, Richard C. Hoagland’s ideas of crystal tunnels and ancient sculptures on Mars, Andrew Baggiago’s ideas of fossils on Mars, and – closer to home – Hoagland’s “Data’s Head” find on the moon are obvious and clear examples of pareidolia and bad image processing, not the desired evidence of ancient advanced civilizations. To be perfectly fair, I really don’t “care” how old Earth is. As far as I’m concerned, I only “know” for sure that it’s just under 28 years old. Or really, it could have been created just a second ago but with the appearance of age and with all of our individual memories forged and everything made with the appearance of age. After all, that’s what you have to believe to be a young-Earth creationist, that every single piece of geologic, historical, astronomical, archaeologic, etc. evidence that points to a planet – much less solar system, galaxy, and universe – older than 6000 years was planted there by some sick, twisted omnipotent being to make us scratch our heads in the fashion of a chimp. Or you have to invent new science that doesn’t fit with anything else in order to make your models work out. I’ll be honest here (as elsewhere) and admit to a guilty pleasure: The TV show Charmed was one of my favorites. And I’m a Harry Potter fan, though that’s more socially acceptable for a guy. Anyway, I love the idea of magic existing, either out in the open or the concept of a hidden world “beyond the veil” that exists alongside our everyday lives but is hidden from us normal folks. In fact, for the past 4 years I’ve been working on and off on my own novel exploring that idea. But here you have the problem of not just a lack of even shaky evidence or suggestions that it’s true, but a solid lack of any suggestions that it’s true beyond the stray anecdote from the mentally questionable. Conspiracy theories are interesting because many of them actually could be true when first broached. It’s when people ignore all evidence to the contrary of a conspiracy theory that it begins to get stupid. For example, the Apollo Moon landings. Every claim by conspiracy theorists have been appropriately answered by reasonable explanations that adequately fit the model that the astronauts landed on the moon. And now we have Lunar Reconnaissance Orbiter images of the Apollo landing sites. This particular conspiracy theory may have made some sense WAY back in the day, but no anyone who clings to it is willfully ignorant or simply delusional. There really is no other, kinder way to say it. Do I want this one to be true? Of course not. I want to see the solar eclipse in 2017. I have plans set for 2013. I’d prefer not to die in some cataclysm at the end of next year. Does my desire for this not to happen cloud my judgement on whether it will? No. Again, much like with the conspiracy theories above, every idea put forward by 2012 doomsdayers has been shown to be simply wrong, not physically possible, or just an outright lie. If there were actual evidence or even a physical mechanism that could occur, then I would reevaluate my conclusion and start eating more ice cream and Doritos. Actually, I think it would be great if there were any kind of simple cause of autism, be it the thimerosal that was used as a preservative in childhood vaccines, parents playing Beethoven to the pregnant mom’s stomach, or solar flares. Unfortunately, there isn’t. Thimerosal was removed from most vaccines in the US a decade ago, and autism rates didn’t go down at all. No one knows what actually causes autism, but it’s definitely not vaccines. Concerned parents should be concerned, but they shouldn’t blame something that protects a child’s health and has conclusively been shown by every study to not cause autism. That about wraps it up. Now, yes, this was posted on April 1st. No, this is not a “fake” nor joke post. In the end, this really boils down to this message for a “true believer” who harps on the “skeptics:” Get over yourselves. We are not “scared” that your-supernatural-belief-of-choice may be true. We would welcome it. Instead of wasting everyone’s time with that straw man, how about actually addressing the legitimate criticisms of the methodology instead of the claims? What I’ve written above are my honest thoughts on the issues. What are yours? I listen to a lot of Coast to Coast AM. I know that a good fraction of the guests are quite literally certifiable, but it’s a good distraction from the mundane work day and, well, it can get addicting. One of the hallmarks of the show, and something that its originator Art Bell would frequently say, is that that they will put ANYONE on to talk about ANYTHING (so long as it’s civil, etc.). This means that you get a lot of crazies. Same with folks who call in (despite the screeners). People who advocate pretty much anything and everything that the “mainstream” does not advocate. And a frequent refrain is that their “theory” is just as good as the mainstream one. Note: All images posted here can be opened in a new window and will be roughly double the posted size for easier reading. Early in my college career I was introduced to the comic strip Get Fuzzy drawn by Darby Conley, one of the only things to which I’m thankful for my roommate. But that’s a different story. Anyway, the premise behind the strip is a single guy, Rob, living in an apartment with an anthropomorphized talking cat and dog. The cat, Bucky, is fairly insane while the dog, Satchel, is fairly dopy. I think the height of the strip was a few weeks where the cat was suing the ferret next door for knocking out his tooth … on Judge Judy. Why am I taking the little free time I have these days to make a post about a comic that has little to do with astronomy? Because it has everything to do with how people think. And it has everything to do with how that maybe 1% of the population is willing to elevate any hair-brained notion to the same status as a scientific theory that has theoretical and observational backing and has withstood all attempts at falsifying it. And I do mean all. This series may be a comic strip, but people really do this kind of thing, and worse, there are people who unquestioningly believe the one lone nut who promotes it! Legal note: All images shown here are housed on the original server and I did not download them. All are copy written by Darby Conley and distributed by UFS, Inc. and posted online at comics.com. For brevity, I have not posted all strips in the series but picked the most relevant. Well folks, I’ve decided to give up the fight. No, not because some “Big Government” folks got to me, nor for the opposite reason that they stopped my paychecks commin’. Rather, I’ve decided to approach life with a much more open, spiritual mind. Over the past few months, from listening to shows like Coast to Coast AM, Skeptiko, ID the Future, and Around the World with Ken Ham, I’ve decided that the world really must have some aspect to it that science just can’t explain. There is just so much evidence of it. People have near-death experiences all the time, proving that consciousness is separate from the brain. Children are born with birthmarks and memories of previous lives, the birthmarks being the exact same locations where they were stabbed or shot by a bullet in those previous lives. Every culture around the world believes in ghosts. Everyone can’t just be imagining it! And then there’s that Dogon tribe in Africa that knew about the companion star to Sirius way before astronomers did, proving they were contacted by ETs. Everyone and their cousin has seen a UFO that has to be proof of ETs or Secret Government Technology controlled by the Men in Black. And there are such convincing test cases – Betty and Barney Hill, and of course the über-clad case of Billy Meier – that it can’t possibly be just someone’s hoax. Horoscopes are in every news paper – even The Onion – and they’re among the most popular sections … people still pay over $500/hr to see astrologers, psychics, etc. They can’t all be wrong! We just have to live in a beautiful, created universe by a loving creator. It was tailored just for us – Earth is perfect for us to live in and inhabit, and that Creator has provided us a wondrous solar system, galaxy, and universe to view and explore. “The heavens declare the glory of God,” indeed. Every culture around the world has some sort of flood story in its past – they can’t all be just imagining it, it can’t all be Yungian collective unconsciousness. So, I have decided on this First day of April of the 2010th Year of Our Lord, to throw in the towel and embrace the unknown. After all, isn’t that why so-called skeptics don’t like it? Because they fear the unknown? They’re afraid to put themselves into God’s hands? They’re afraid to admit that there may be something more powerful out there than themselves, or that their science cannot explain? Besides, with the world ending in just 3 years, at the end of 2012 since the Mayans were excellent astronomers and predicted this, why should I spend the last years of my life worrying about convincing people not to believe what everyone else on the planet does? (1) There will be a UFO sighting in or near a major US city during 2009. The government will have no official confirmation of it being a UFO. (2) Despite a lot of pressure from certain groups (such as MUFON) and the apparent interests of his transition chief, John Podesta, Barack Obama will not do any UFO disclosure once he becomes president. (3) Assuming the Large Hadron Collider actually becomes operational, there will be a significant earthquake that will cause damage when it does. And within 2 weeks, there will be at least a magnitude 6 earthquake. (4) Towards the end of March and through the first weeks of April, the sun will swallow an entire planet, though it will miraculously emerge intact by May. (5) Scientists will still not be able to explain why constants, such as gravity, the speed of light, and the mass of quarks are what they are from first principles, leaving open the possibility that the universe was designed by an intelligent being. (6) People will continue to believe that the planet Niburu is going to throw Earth out of orbit in 2012, despite those annoying scientists who say otherwise. (7) On January 7, February 3, March 3, March 30, April 26, June 20, July 17, August 14, September 10, and November 3, the great reflective orb in the heavens will occlude some Sisters from sight. (8) 2009 will be another year for some amazing new discoveries in astronomy, especially in the fields of extrasolar planet research and large-scale cosmology. (9) Much fewer sunspots than had been predicted will continue to confuse astronomers, and there will be some people who link it to global temperatures. Aries: You will find that anger does not work well in places of employment, except when it is able to accomplish your goals. Taurus: Your headstrong nature may lead you astray unless you temper it with your more pragmatic side. Gemini: You found 2008 economically depressing, but if you’re careful and plan wisely, you can recover in 2009. Cancer: If you pay close attention to your home life, you will find 2009 to be very rewarding domestically. Leo: 2009 is not the best year for you to strike out on your own. Keep your attention-seeking tendencies in check and you will find your efforts rewarded. Virgo: This is a year where your ability to help others should flourish. Libra: Keep trying to be less lazy this year, especially in your procrastination. Doing so will help in all aspects of your life in 2009. Scorpio: When someone does something you don’t like or disagree with, don’t feel as afraid to speak up. As long as you’re calm and rational about it, your ideas should be met with appreciation. Sagittarius: Seek out new things in 2009. Find a new hobby, make a new friend, etc., and you will be rewarded for the experience. Capricorn: Remaining practical and pragmatic in this year of change will help ground you throughout 2009. Aquarius: Take a chance this year – your originality in the work place may be rewarded. Pisces: You may find a friend trying to confide in you this year, and if you let your own sensitive, empathic side come through, your friendship will deepen and they will be very appreciative. I thought I’d lighten the tone and include some responses I’ve gotten in past years on homework answers. Most of them speak for themselves, but there are some that I’ll append a small explanation to. Pay close attention to spelling, as these were copied directly and sometimes the humor lies in the mis-spelling of just one word. (1) The Big Bang occurred, because of a rule in Astronomy: If you squish it, it heats up. (2) Since Stars are made mostly of Hydrogen and helium and so are we it is safe to say that humans are made of “star stuff.” Th chemical male up of th two are similar. (4) The reason that Pluto doesn’t fit these classifications [of terrestrial or jovian planet] is because with respect to distance from the sun and temperature, it is a jovial planet. (6) [Terrestrial planets] have an abundance of mental deep in their interiors. (7) Most of the matter in the universe is in the sun, the largest body in the universe. (9) For one, the majority of the mass in the universe is located in our sun (made up mostly of hydrogen and helium). Furthermore, the largest planets are also mostly hydrogen and helium. Considering this, the Earth and moon (and other terrestrial planets) make up a small portion of the whole solar system. (10) Earth is made up of medals and rocks and not primarily hydrogen and helium. (12) Much of the asteroids and minor planets orbiting the sun appear to be debris from a past explosion that collided with the solar nebula. (13) Hypothetically if the Sun all of a sudden stopped thermonuclear fusion the Sun would start to contract, because the outer layers would no longer be supported by the internal gas presser. (14) I calculated the thermal speed of hydrogen to be 2405.08 and that of deuterium to be 2892215.569. However, I’m horrible at math and could be totally messing this up, especially as it is late at night since I have rehearsal until 11 every night (ah, the life of a theater major…but I digress). (15) The spacecraft of the Pioneer 11 mission would have been sucked into the Cassini gap by the gravitational pull. So they wouldn’t have a spacecraft anymore. (16) Titan is the second largest satellite in the atmosphere. (17) In the universe the Earth is the fifth largest planet. (18) The universe is about 10 times bigger than the Milky Way galaxy. (19) The entire universe is infinitely large, containing trillions of universes. (21a) The entire galaxy is another 10 times larger than the Milky Way. (21b) The Galaxy is about 1,000 quadrillion kilometers aka 100,000 light-years. And then, the galaxy is even larger at about 1,000,000 light years. (22) A solar day is four minutes longer than the cideral day. The Earth violates around itself and around the Sun. This violation around the Sun causes the earth to violate aproximately 1 more degree to complete a solar day. (23) A solar eclipse occurs when the moon passes directly infront of the moon. (25) Question: Name and describe all the different types of objects found in the solar system. Answer: Extrasolar planets – planets that revolve around a star other than out sun. (26) Next you find the sun, this is the largest object in our universe and accounts for 99.9% of the universe’s mass. (29) Uranus was discovered by an amateur astronomer nerd William Herschel.